The Jaquet Droz Grande Second Moon Phase comes in three versions but it's the stainless steel version with black onyx dial that has our attention. The watch features an easily recognisable figure eight design that made the collection famous, with the hours and minutes displayed on the smaller dial on top, and the moon and stars (both made of white gold) displayed on a large black onyx disc. Paired with a black alligator strap, this black-on-black combination gives a very classy yet discreet look—perfect for a black-tie event. Minute repeaters are some of the most technical watches to produce and the Chopard L.U.C. Full Strike is the brand's first. It turns out to also be their best, since the watch just won the "Aiguille d’Or" at the GPHG (the Grand Prize at the "Oscars of Watchmaking"). This watch stands out from its peers by having gongs made of sapphire instead of the traditional stainless steel and you can see the whole minute repeating mechanism in action on the dial side instead of having to turn over the watch. Wearing this watch will elegantly dress your wrist while showing people your knowledge in watchmaking. 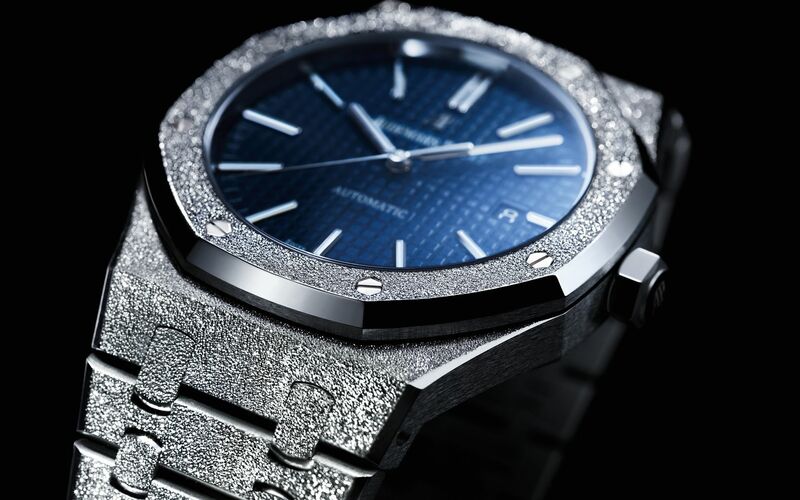 This year's SIHH saw the release of the 33mm and 37mm Royal Oak Frosted Gold in white and rose gold, which was aimed at a feminine clientele but Audemars Piguet was surprised to discover that many male clients wanted to have one for themselves too. Their wish has finally been granted with this 41mm Royal Oak Frosted Gold. The unique look of the watch is achieved by a hammering technique used by Florentine jeweler, Carolina Bucci which gives the watch a diamond-like look. Made in white gold only and as a limited edition of 200 pieces, this could be the perfect "his & hers" combination at your next red carpet event. The Rolex Oyster collection is by far their most popular but you might not know about their Cellini collection, which is the brand's more elegant offering. Moonphases haven't been seen on Rolex dials since the 1950s and this watch is very much a throwback to some vintage models that collectors go crazy for. The dial is made of white lacquer with a blue enamelled disc for the moon phase and the date is positioned around the circumference of the dial. The rose gold case completes the understated look of this watch. It doesn't get more dressy than this; a time-only Piaget watch with a white gold case and one of the thinnest movement you can find (2.35mm thick) which you can admire through the transparent caseback. Adapted for contemporary sizes at 43mm, this watch might be too simple for some people, but to others, it's everything.